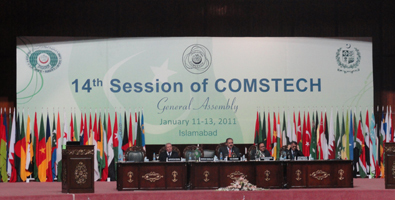 Dr. Savaş Alpay, Director General of SESRIC, addressed the Fourteenth Session of the Organization of Islamic Conference (OIC) Standing Committee on Scientific and Technological Cooperation (COMSTECH), which was held at Islamabad on 11-13 January 2011, under the Chairmanship of H.E. Mr. Yousaf Raza Gillani, Prime Minister of the Islamic Republic of Pakistan and Co-Chairman COMSTECH. Nearly three hundred delegates from twenty-nine member states and twenty-four international and regional organizations attended the meeting. Dr. Alpay presented an overview of current trends and developments in the OIC Member Countries in the fields of scientific research, and science & technology, and touched upon key determining factors related to the performance of OIC Member Countries, showing their stand in the world with respect to these factors. Dr. Alpay concluded his presentation by underlining some broad policy implications as well as stressing upon stimulating R&D to the target level of 1% share in GDP in the foreseeable future, as set by the OIC Ten-Year Programme of Action in 2005. The meeting started with opening addresses by H.E. Pir Aftab Shah Jilani, Federal Minister for Science and Technology, H.E. Prof. Atta-ur-Rahman, Coordinator General COMSTECH, H.E. Prof. Amadou Tidiane B.A, Minister for Scientific Research, Republic of Senegal and H.E. Mr. Yousaf Raza Gillani, Prime Minister of the Islamic Republic of Pakistan and Co-Chairman of COMSTECH. Five plenary Sessions were held with the participation of heads of Delegations and representatives from various OIC Member Countries and National and International organisations. In the light of these sessions, the senior officials made their presentations and read their reports in which they deliberated on a set of common issues of concern to the member countries with a view to enhancing new mechanisms and initiatives to draw policy guidelines and encourage cooperation for the COMSTECH Program. The 14th Session of COMSTECH General Assembly adopted a number of Resolutions where the Ministers of Science and Technology of OIC Member Countries endorsed the recommendations contained in the report of the Mid-Term Review of the OIC Ten-Year Programme of Action and OIC Vision 1441H for Science and Technology in Dubai in December 2010, whereby the delegates requested the SESRIC to implement capacity building activities in the area of S&T for the sake of enhancing the STI capacity of the relevant institutions in the member countries as well as for facilitating higher commercialisation of scientific research towards knowledge-driven economies.